Create drama and visual thrill in your garden by planting perennial color. Bold colors will draw the eye and elicit “oohs” and “ahhs” from you and your visitors. 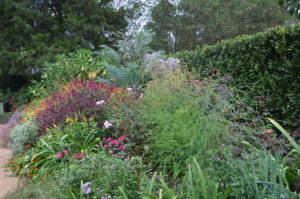 MFBG Horticulturist Bennett Dowling will show you how easy it can be with just a little planning you can use plants for continuous color, texture and year-long interest. Take advantage of Bennett’s amazing eye for design and color combinations! This class takes place inside and outside, so dress accordingly. Join us on Saturday, May 4, 2019 from 9:30AM-Noon. This class is just one in a Colorful Year series, which includes Vivid Containers and Winter Color. A Colorful Year Package (all 3 classes) is $45. One class is $20.